Do you avoid visiting a dentist due to the physical pain that the docs’ drilling instrument will inflict? Then, it’s time to stave off that pain. With advancement in technology, a dental treatment isn’t as painful as before. Moreover, ignoring the initial signs of deterioration can prove disastrous to your dentures in due course of time. “Anyway it is all psychological. Now the technology is so advanced that before you realize, it is almost painless. 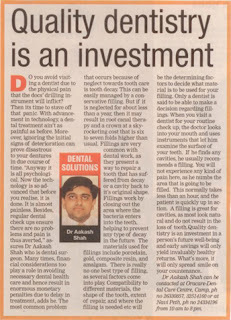 Besides regular dental checkups ensure there are no problems and pain is thus averted,” assures Dr. Aakash Shah who is dental surgeon. Many times, financial consideration too plays a role in avoiding necessary monetary penalties due to delay in treatment, adds he. The most common problem that occurs because of neglect towards tooth care is tooth decay. This can be easily managed by a conservative filling. But if it is neglected for about less than a year, then it may result in root canal therapy and a crown at a skyrocketing cost that are six to seven folds higher than usual. Filling are very common with dental work, as they present a way to repair a tooth that has suffered from decay or a cavity back to its original shape, Filling work by closing out the area where the bacteria enters into the teeth, helping to prevent any type of decay in the future. The materials used for filling include porcelain, gold, composite resin, and amalgam. There is really no one best type of filling, as several factors come into play. Compatibility to different materials, the shape of the tooth, extent of repair, and where the filling is needed etc will be the determining factors to decide what materials is to be used for your filling. Only a dentist is said to be able to make a decision regarding fillings. When you visit a dentist for your routine checkups, the doctors looks into your mouth and uses instruments that let him examine the surface of your teeth. If he finds any cavities, he usually recommends a filling. You will not experience any kind of pain there, as he numbs the area that is going to be filled. This normally takes less than an hour, and the patients are quickly up in action. A filling is great for cavities, as most look natural and do not result in the loss of tooth. Quality dentistry is an investment in a person’s future well- being and early saving will only yields invaluably healthy returns. What’s more, it will only spread smile on your countenance.